Erika Isler is a certified coach, journalism instructor and professional writer/editor, as well as an eager participant in the work of life. 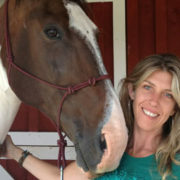 Working with horses to help people brings her life full circle. Although she spent her childhood around horses, she put that interest away for many years only to have it resurface after writing feature story about Koelle Simpson. A veteran newspaper and magazine reporter and editor, she spent more than 20 years interpreting and sharing people’s stories. And now as a coach, she helps her clients create insight, gain perspective, and step into and utilize their natural abilities. She works with executives, entrepreneurs and individuals seeking clarity, purpose and direction for their talents and goals.